Do you ever feel as if you are on a parenting treadmill trying desperately to catch up? There is always one more thing to do. It doesn’t have to be like this. Parenting can and should be fun. Lots of fun! Follow these 4 simple steps to create space and find the joy. It might just save your sanity! Sometimes it takes my breath away. Often it leaves me feeling overwhelmed. I brought my children up before the Internet. As a family we were not connected to the web until my boys were in their tweens. In many ways I am glad. All this information would have left me feeling totally inadequate. Yet another parenting strategy to implement. And round and round it goes. Do you want to stop the treadmill and find a way to bring some sanity into this frenetic pace of life? If you are worried about the things that haven’t done, your full attention can’t be on enjoying your family today. Your children are with you NOW. Time is fleeting and before you know it you will be helping them pack for college. One of the best ways to enjoy your children is to start living in the present. 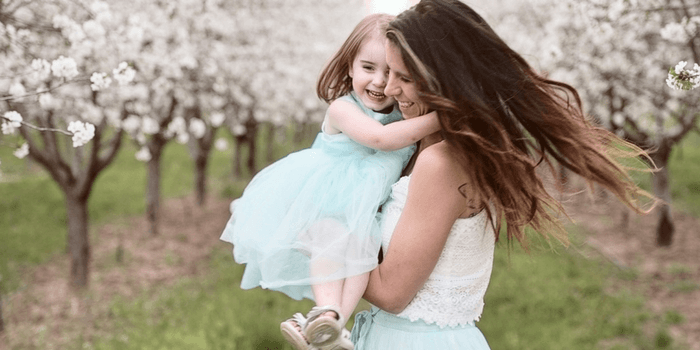 Instead of focusing on all the things you need to do, learn how to put them aside and start treasuring the precious moments with your children. There is a phenomenon that many simplicity bloggers are talking about these days. It is F.O.M.O (Fear of Missing Out). This fear is one of the things that keeps us glued to social media and our computers. I think we parents also worry that our kids might be missing out. If I don’t make sensory bins my children will miss out on meaningful experiences and be less perceptive. I should spend time making on pre-literacy and math games or my child will miss will be behind when they get to school. How can I serve plain ordinary bananas when other mothers are making Minion bananas? Unfortunately all these wonderful ideas on the Internet have increased expectations. Before the Internet parents could only compare themselves with the people they knew. Now we are comparing ourselves with the whole world! All this comparing and doing = frazzled parents and time away from family. Make sensory bins – Just take your kids outside and let them play. There are unlimited sensory opportunities in nature. Your children will find them without any prompting from you. Easy peasy! Organize literacy games- just read to your kids every day. Studies indicate that reading to your children is the best way to encourage reading. Create enriching learning activities – instead let your kids have lots of time for free play. Studies show it is the best way to give your kids an academic advantage. Scour Pinterest for activity ideas- download and print these play prompt cards and spend some time playing with your kids? Do you get the idea? Stop worrying. Close that computer for a while. Slow down the pinning. Your children won’t miss anything important and you will enjoy your time together as a family more. When we DO less we create space for what is really important. When we OWN less we automatically reduce the amount of time needed for cleaning and organizing. Can I encourage you to Stop! Slow Down and Simplify? I have found that embracing less allows me to fully enjoy what I have? Try reducing the number of toys your children have and watch what happens. You will be amazed. We were! I am not suggesting that we give up all the things we do for our children. If you enjoy creating sensory bins then go ahead and make them. If you find joy in arts and crafts; it makes sense for you to find and enjoy craft projects with your family. Love science? Then go ahead and enjoy science projects with your kids. Remember that what gives others joy won’t necessarily be the same. 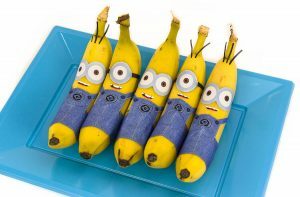 Just because you read a post about a mom creating amazing things from bananas doesn’t mean you have to follow suite …. unless of course decorating bananas brings you joy. 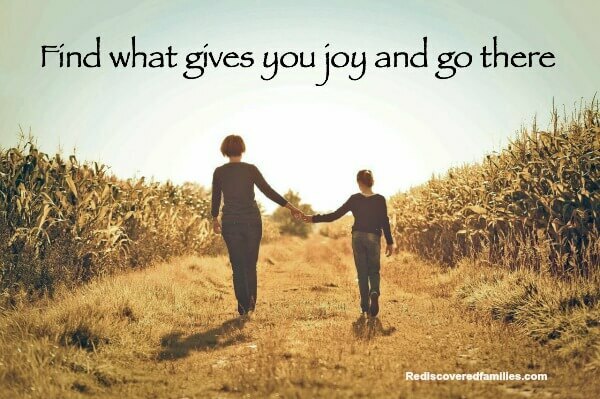 When we discover and follow what gives us joy our lives become meaningful and fun. Why should we wait until our kids are grown before doing that? Surely we can incorporate this idea into the way we spend time with our children? I think parenting should be fun. Lots of fun! It is unrealistic to expect every minute to be wonderful. Parenting can be really hard at times. Still I hope we can experience lots of joy and laughter with our families. If you are feeling overwhelmed with all the demands of parenting, perhaps it is time to make some changes. Take a pause and reassess. It might mean taking a break from Pinterest, going back to simple play, or addressing the fear of missing out. It will almost certainly mean letting go of stuff and time commitments. Still once you get off the parenting treadmill, you may discover that you already have everything you need to do an amazing job. The secret to being a good parent is not found on-line. You will discover it as you play and laugh with your children. I agree with this so much – but find it difficult to do, lol! For Kay’s birthday this year, she wanted to make her own invitations and goodies bags (just paper bags with stickers). I occasionally worried what the other parents would think, with their fancy parties. But this is what she wanted and she was totally proud of her simple party. A lot of times it’s the parents who want the fancy crafts and activities – kids are just happy to have time with us! The party sounds wonderful! Isn’t it great how our children often show us the way? I think you are right when you observe that often it’s the parents who want to fancy things up. Children just want to be with us. I agree, we read so much it is difficult to put things into perspective. I am trying to slow down and just enjoy the moment, but life can often take over and you get swept along with things. I think that awareness is a really important step. Hopefully as we look for ways to slow down we will recognize when we are being swept along with things and be able to take baby steps to change things for ourselves. Sharon, I so deeply thank you for sharing this message of Real simplicity…. I have had a blog for 3+ years. The last few years I have stopped writing. I just ‘can’t keep up,– but I could! If I let go of watching everyone else post weekly, daily, pretty well decorated foods (like minion bananas) I started comparing myself SOO MUCH, I allowed myself to stop connecting with my own community if bloggers. I have not quit the fight in picking up the pen again. I do it for free, for me, for my family and children to enjoy while growing. Thanks for letting me air that out here:D I truly appreciate your message. More and more now as Spring has started, I have committed to putting down the ‘internet’ Pinterest etc. Even Instagram! Just a heartfelt thank you. Your message here is so encouraging. Wow Jeanine I can’t tell you how encouraging it was to read your comment. Thank you so much. I took a peak at your blog and loved it. I hope you can get back to writing. I totally understand what you mean about the comparison trap and getting sucked into the Internet! I struggle with those things too!